Established in 1887, Dinard is France's second-oldest club and is steeped in history. Founded by a group of British settlers and designed by the famous Scotsman Tom Dunn, it is clearly modelled on the great courses 'back home'. Totally authentic and simply oozing class and quality, it's an absolute joy from the first tee to the final green. With sandy turf, rolling fairways, classic pot bunkering, wonderful sea views, heather, gorse and small, well-defended greens, it has everything you would expect of a great links course of international renown. And the Art Deco clubhouse is an absolute gem. At less than 6000 yards, it's a dramatic illustration that length is not a necessary component of a great course. 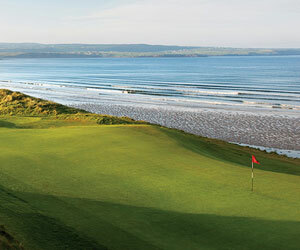 Unquestionably a 'must play' for those with a feel for golf's history and traditions. Law season: (from the 01/01 to the 28/02 and from the 12/11 to the 31/12) : 50€. Green Fee end of the day : 9 holes (from 15:00 pm) : 35€. Middle season: (from the 01/03 to the 13/07 and from the 03/09 to the 11/11) : 75€. Green Fee end of the day : 9 holes (from 16:00 pm) : 50€. High season: (from the 14/07 to the 02/09 and week-end of Easter, Ascent and All Saint's Day) : 90€. Green Fee end of the day : 9 holes (from 17:00 pm): 60€. Directions: 8km west of Dinard. 15km west of Saint-Malo. Dinard is not so much a golf course as a religious experience. Absolutely stunning from the first tee to the 18th green. An unforgettable experience and a glorious gem of a clubhouse to top it all off. Vive Dinard et vive la France! This a lovely course. Not as tough as some of links courses I've played in Wales, but still a good test for any golfer, particularly if its a windy day. Watch out for the lightening fast greens !! Although Dinard has a turn of the century feel to it, it also is well set up and has everything you will need. Definitely worth playing if you're around the vicinity. This is a fantastic golf course and the second oldest in France. We went as a group of 16 players. A nice mix of links and some parkland but mostly along the coastline. 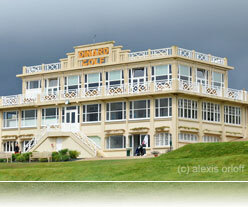 Club house is an Art Deco delight and the 'stek frites'..... the best that money can buy. Hotels are plentiful and varied and the town of Dinard itself is glorious. Try it, you won't be disappointed! I'm Fabrice the manager of this course. Thank you about your comments. The course is situated at SAINT BRIAC not at SAINT BRIEUC far from 50 km.